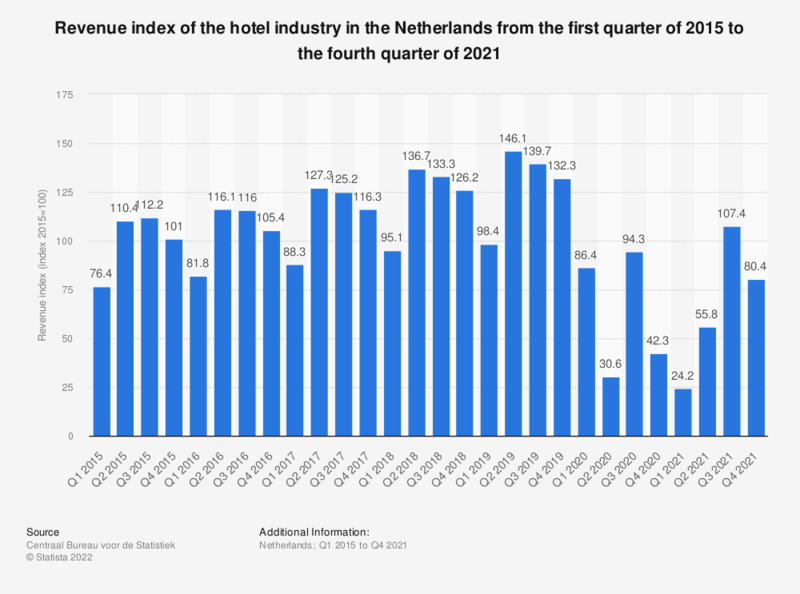 The statistic illustrates the revenue index numbers of the hotel industry in the Netherlands from the first quarter of 2015 to the fourth quarter of 2018. In the third quarter of 2018, the revenue index was 133.1, an increase of roughly eight percent compared to the third quarter of 2017. Looking at another aspect, the revenue index of the hospitality industry, it can be seen that the first quarter of 2015 had a revenue index of 82.5 (index 2015=100). In 2017, the index increased to 106.5. * Figure 2018 is provisional. Everything On "Hotel industry in the Netherlands" in One Document: Edited and Divided into Handy Chapters. Including Detailed References.